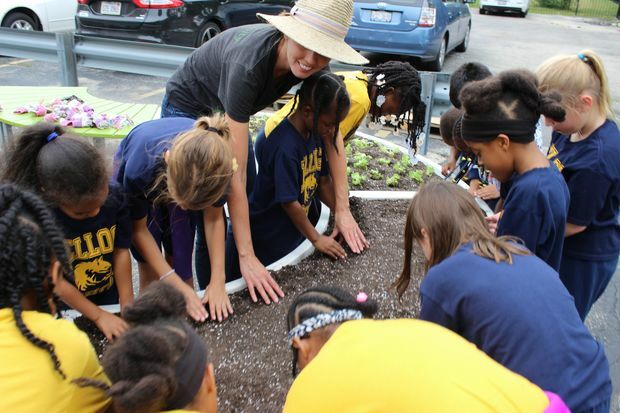 BEVERLY — Students at Kate S. Kellogg Elementary School in Beverly got their hands dirty planting an "Edible Learning Garden." All grade levels from the school at 9241 S. Leavitt St. participated in the project Friday sponsored by The Kitchen Community, a Colorado-based non-profit founded by restaurateur, environmentalist and entrepreneur Kimbal Musk. "Many of the junior high students had never done anything remotely close to gardening," Principal Cory Overstreet said. 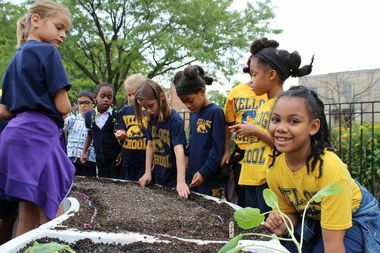 Corenna Rooszeboom, a garden educator for the non-profit, said the group has built 121 similar gardens at schools throughout the Chicago area. The idea is to give students enough vegetables to make a salad. Students will be able to take home some of the fresh produce, said Nicole Maldonado, a Kellogg parent with a first-grade student. She credited kindergarten teacher Michelle Vinezeano for bringing the program to the school. Maldonado said some of the produce will also be donated to local food banks, and teachers plan to incorporate the garden into their lesson plans whenever possible. "There are lessons with math, like when it comes to seeds and counting," she said. Emily Lambert, another Kellogg parent, said the project is an outgrowth of the community garden club that began last year. Made up of parents, grandparents and those living nearby, the group meets at 4 p.m. Mondays — rain or shine. From there, a kids' garden club was launched at 3 p.m. Tuesdays. So far both clubs have largely focused on gardens on the south side of the campus, which includes a custom planter with a Kellogg's Breakfast Tomato plant, Lambert said. Parents, students and community members worked on the gardens throughout the summer too and will help to maintain the plants placed on the east side of the campus Friday, Lambert said. "It has really grown a community at this school," she said.